Intaglio printing lends the banknote its exclusive character. Strong denomination colors, striking portraits and ornamental designs, and not least the relief-style embossing are the unmistakable features of this sophisticated printing technique. Thanks to the use of computer-aided FIT engraving technology, translucent multi-tone structures can be produced in addition to tactile elements. The result is a wide spectrum of additional color shades. Embedded security elements for human detection, as well as functional areas for machine readability, reinforce the valuable contribution that intaglio printing makes to banknotes. FIT (Fine Intaglio Technology) is a proven security feature based on traditional intaglio printing. This process was developed as far back as the Middle Ages, making it the oldest printing technique in the world. In 1996, the company G&amp;D introduced a computer-based, high-resolution engraving technique which for the first time made it possible to engrave fine lines on the intaglio plate. 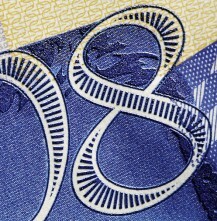 This has led to the development of new security features that set new standards in the production of banknotes and documents.Intaglio printing gives banknotes a unique appearance which protects them from imitation. These banknotes are characterized by rich colors and highly tactile structures. What is more, the banknote paper is not only printed with ink, it is also heavily compressed, giving banknotes a long-lasting, clean appearance. FIT latent; the new generation of latent images offers a genuine digital image flip on a 3D background. The element is embedded directly into the intaglio master by means of high resolution laser engraving and then embossed onto a reflective metal patch of the banknote paper. Tilting the banknote changes the image, making two different motifs visible. PEAK (Printed Embossed Anticopy Key) is another security feature from the company G&D that offers an easy way for the public to check the authenticity of banknotes.The special thing about the PEAK (Printed Embossed Anticopy Key) security feature is its production process, in which the banknote paper is simply printed and embossed. Fine lines in carefully selected shades are embossed to produce a three-dimensional, optically variable image. Different information and colors are visible depending on the angle from which the banknote is viewed.